Concerned about Alzheimer’s Disease? 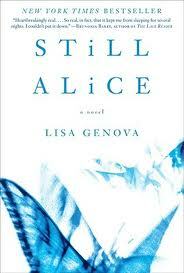 Read “Still Alice” by Lisa Genova. H ave you ever thought about Alzheimer’s disease as it relates to you? Do you have a relative, perhaps a parent who suffers from it? I did. My father. Many thoughts and worries have surfaced since he was diagnosed with “symptoms consistent with Alzheimer’s”. The only way to know for sure if it’s Alzheimer’s or some other form of dementia is to perform an autopsy. At that point, it doesn’t seem to matter so much, what it was that caused the loss of memory and motor skills and finally, death. I believe it was Alzheimer’s but I’m not sure it matters. What matters to me now is, is it hereditary? Will I get it too? Probably? Maybe? Every day I look for it. Am I forgetting too many things? Is it that I forget or that things just seem to skim the surface of my consciousness? I am preoccupied, I am not paying attention, I just don’t care enough about that particular fact. Maybe. Maybe not. I don’t know anything for sure. My friend suggested I read a book called “Still Alice” and I did. I just finished it and it was wonderful and highly recommended for anyone, whether you have people close to you suffering from it or not. It was written by a woman who has a Ph.D in neuroscience from Harvard University and is an online columnist for the National Alzheimer’s Association. Combined with that knowledge, and a definite writing flair, she has crafted a fictional account of a woman besieged with early-onset Alzheimer’s. The woman is only fifty when she is diagnosed. The novel is written from the POV of Alice, so the reader identifies with the confusion, the uncertainty, the despair she goes through as the disease progresses. Alice can only sit and watch her life fade away, as she struggles to hang on to memories of her husband and children. When she can’t remember their names, she still remembers them. She knows they are her son and her daughters, but fears she doesn’t know this through understanding, but because they keep telling her. She struggles to understand as her family talks around her, as if she weren’t present. She wants to tell them things but can’t get her thoughts out fast enough and forgets them anyway. She hallucinates and believes there is a hole in the floor that she must go around. She tears the house apart looking for things but then can’t remember what those things are. She can’t recognize herself in the mirror, because she thinks she is a young girl. She confuses her dead sister with her daughter. It’s powerful, the thoughts and fears that Alice experiences. And the writing is brilliant, very moving, and educational too. Add to all that, the development of some very fine characters and you have a novel well worth reading, not only for the knowledge it imparts but because it is a moving story. I hoarded this book. I didn’t want it to end. I thought of my father, as I read it, and wondered how much of this he went through. No one knows for sure, because no one who is going through it can tell you what it’s like. We watch our parents suffer with it and yet, on some level, we think that won’t happen to me, or I’ll deal with that later. This novel brings it home, makes it real. If you aren’t comfortable with that knowledge then this novel may not be something you’d care to read. I’m glad I read it, but up until now, I don’t think I was ready. This entry was posted in Aging, Alzheimer's, Book Reviews and tagged Alzheimer's Disease, Early-onset Alzheimer's, Lisa Genova, Still Alice by Lynn Schneider. Bookmark the permalink. Our book group read this a while ago. And I agree with you. A definite recommend. My MIL had dementia, probably vascular, and very hard to watch. Thanks for sharing this. I loved it. I thought it was very unique, that the author tried to simulate what Alice went through. It was a beautiful book, I’m glad I read it because it’s given me a lot of new understanding. Thanks for bringing up this subject that cuts so close to the bone for many of us. The movie Away From Her is one to watch, moving and surprising at the same time, with great actors. The movie is strangely comforting, as it focused on the wife who is disappearing into her own world and shows the surrpising solutions she finds, although it also shows the pain of those left behind. Thanks Johanna. It sounds like a great movie recommendation. It’s hard not to find someone with at least one relative affected by dementia. It’s troubling. People didn’t used to live so long that they got dementia, they died of other illnesses before it ever manifested itself many times. Not so much anymore when we’re kept alive with drugs. Thanks for the recommendation, Lynn. In my case, it’s my sister who is 19 years my senior. She started to slip into dementia at age 82. Now she lives in a “Memory Care” facility where she is happy, but doesn’t know who I am. I keep chronicling how much we are similar genetically, but also how we are different in choices we have made over the years with regard to diet, physical and mental exercise. While she was still lucid she told her daughter to be sure to get an autopsy on her. The autopsy will reveal whether it was Alzheimer’s or not. The fact that there were differences between you and your sister’s lifestyles I would think would be a factor. I do recommend this book, it was educational and also a great novel. Loved the dialogue, the characters. Everything about it.